Life has been awfully busy lately. So much so, that it has affected me from doing blogging as regularly as I like to do. So, I would like to take a little time to let you know what I have been up to this past month. Work has seen me driving me from one corner of the Phoenix metro area to the other, meeting with clients and helping them to create beautiful outdoor spaces. In fact, I broke my record for the most landscape consultations in a single month. Now that the holidays are here, work has slowed down a little. One thing that I enjoy about visiting new clients is that I get to see impressive specimen plants like this Euphorbia trigona that flanked the entry of the Phoenix home. This is a truly beautiful succulent that lends a tropical look to the landscape. It is very frost tender and must be protected when temperatures dip into the 30’s. I’d say it’s worth the effort for a plant like this. Encounters with wildlife happens often during my work. However, seeing a coyote in the middle of the day is rather rare. As I was driving home from a consultation, I saw this beautiful coyote walk across the street. I stopped my car and it stood off to the side of road while I took a few pictures with my phone. While I’ve seen a number of coyotes over the years, most often their appearance reflects the hardship of living in the desert. However, this coyote was the healthiest one that I’ve encountered. I think that it enjoyed the attention that I was giving it as it stood still for several seconds before walking off into the desert. Christmas is my favorite season of the year. I enjoy shopping for the perfect gift, decorating the house, baking my favorite desserts, singing along to Christmas music in the car, and rejoicing in the reason for Christmas. Earlier this week, we filmed a video segment for our church’s upcoming Christmas Eve services. We were asked to share the story of our daughter Ruthie’s adoption along with her cousin Sofie. They were best friends in the orphanage when my sister and her family adopted Sofie back in 2006. One year later, my husband and I went to China and adopted Ruthie. So, they are not just best friends, but cousins. We taped the video at my sister’s house, which took over 3 hours. The segment will probably only be 3 – 4 minutes in length, but I can hardly wait to see their story shared and hope that it will inspire others. I will be sure to share it with all of you at that time. I hope that you all had a wonderful Thanksgiving and are enjoying this holiday season. As a mom, grandmother, and horticulturist, the fall season is a very busy season for me. Whether I’m busy on the work site, hosting a Halloween party, or helping out my mother as she recuperates from a broken leg – there is never a dull moment. I thought that I would show you just a snippet of the events of the past few weeks. My mother’s orthopedist knows how to decorate his office for Halloween. Over a month ago, my mother suffered a very badly broken leg that required surgery. My very active and independent mother has been working hard with physical therapy and her recovery, but still has a few weeks left in a wheelchair. As a result, my siblings and I have stepped in to help her where we can. One of my favorite ways to help out is to take her shopping wherever she wants to go. Of course, it helps that she and I like the same types of stores. We got into a lot of trouble in Target’s dollar section buying Christmas decorations and gifts last week. My granddaughter Lily enjoyed talking to our desert tortoise, Aesop, during her visit to Arizona from Michigan. Visits from my oldest daughter and her family are always a highlight for us. My 3-month old grandson, Leo, slept through most of his first visit to Arizona. Every year on October 31st, my siblings and their kids come over for a fun night of Halloween-themed food and trick-or-treating. It is so much fun to see the little kids get all dressed up for Halloween, including my grandson, Eric. While my two youngest kids are almost too old for trick-or-treating, they enjoyed dressing up and going with Eric. Life hasn’t slowed down in November, which is the busiest month of the year for me as a horticulturist. A highlight of this month was a visit to an open house at one of the pre-eminent nurseries of the Southwest. While you may not have heard of Mountain States Wholesale Nursery, you have undoubtedly seen plants that they have developed, many which may be in your own garden. Flowering shrubs such as ‘Valentine’ and ‘Blue Bells’ have their origins in the fields of this nursery as do many of the newest tecoma and desert willow species. I spent a fun-filled day with friends and colleagues touring the facilities and getting a sneak peek at their newest plants in production. The perfect way to cap off our visit was being gifted with a new plant! Next up on my agenda was overseeing the installation of one of my landscape projects. My clients, who live in New York City for most of the year, spend their winters and spring in Arizona. They recently purchased a home with overgrown, excessively pruned shrubs as well as artificial grass with a putting green that they wanted to get rid of. I initially met with them in April and put together a plan for a landscape that would reflect their style. Once they came back to Arizona in November, they asked me to come out and oversee the installation. A mixture of pink muhly (Muhlenbergia capillaris) and artichoke agave (Agave parryi ‘truncata’) are being planted in the area formerly covered by artificial turf. Many of the old shrubs were removed as was the fake grass. Contouring was added to help add height and interest to the formerly flat backyard landscape. Matt, is the landscape contractor, who I refer many of my clients too. He has the uncanny ability to find the biggest, best plants – he holds his sources close to his chest, but as long as my clients are happy, so am I.
I must admit that I am sorely tempted to grab one of his specimen cactus or succulents for my own garden. The client wanted an area for a cactus garden. So, we took out the shrubs in this corner and added cactus. The saguaro cactus isn’t in place yet, but soon will be. Our goal was to add several different types of cactus and succulents that the client liked, including beavertail, candelilla, golden barrel, Moroccan mound, and torch cactus. An ocotillo anchors the corner and will eventually leaf out and flower, which usually occurs about a year after planting. A palo blanco (Acacia willardiana) tree will soften this area without outgrowing this area. It is so rewarding to be a part of the process of homeowner’s landscape be renovated into a space that will provide them with years of enjoyment. Despite the busyness this fall season, I am getting excited for the upcoming holiday season. How about you? What is keeping you busy this fall? AZ Plant Lady House Call: What’s Wrong With My Bougainvillea? **Disclosure: This post contains an affiliate link of a product that I use in my garden and I recommend to those who are experiencing similar problems. A week ago, I was called to see one of my regular clients to see how her landscape was progressing since she had installed a lot of new plants at the beginning of summer. The majority of her plants looked great considering she had planted them at a particularly tough time of the year. BUT, what caught my attention was her bougainvillea shrub. The leaves were quite ragged and looked like something had been chewing them. In addition, there were some small black droppings scattered among the leaves. The culprit was bougainvillea looper caterpillars. yellow-green to brown colored inch-worm. The signs are ragged leaves that appear to have been chewed along with the black droppings. My bougainvillea growing in the back garden. I haven’t seen any signs of caterpillar damage yet. If you see similar damage to your Bougainvillea, don’t panic. 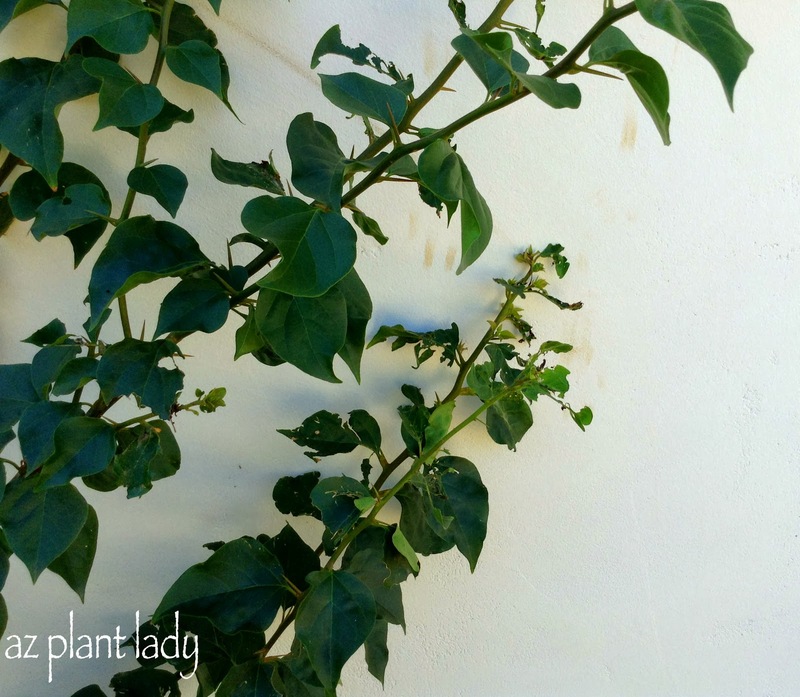 Most Bougainvillea can handle the damage from the chewed leaves. In the case of my client’s bougainvillea, I told her that the damage was not severe enough to warrant any treatment. Some of you may see similar damage to your yellow bells or orange jubilee shrubs, which I wrote about in a previous post, “Oh No, What’s Happened to My Shrubs”. **In the future, I will be sharing some gardening problems or design challenges that I encounter during some of my consults and their solutions. I hope you have a great weekend. We will be celebrating my 3-year old twin nephews birthday at our house tomorrow morning. I’ll may post a picture or two next week from the party. My daughter, Rachele, is doing well after the first week of her combat training in Mississippi. But, she did share some funny stories that I will share with you next week too! https://www.azplantlady.com/wp-content/uploads/2013/09/Bougainvillea-on-house.jpg 407 640 arizonaplantlady@gmail.com http://www.azplantlady.com/wp-content/uploads/2018/10/favicon.png arizonaplantlady@gmail.com2013-09-20 22:37:002017-04-26 12:18:52AZ Plant Lady House Call: What's Wrong With My Bougainvillea? This beautiful plant is one of my favorite shrubs in the garden – so much so, that I have three. Yellow bells produce bell-shaped flowers beginning in spring and lasting through the fall months until the first frost. Hummingbirds and butterflies are attracted to the flowers. The vibrant green foliage and colorful flowers make this shrub a welcome addition to any desert landscape. 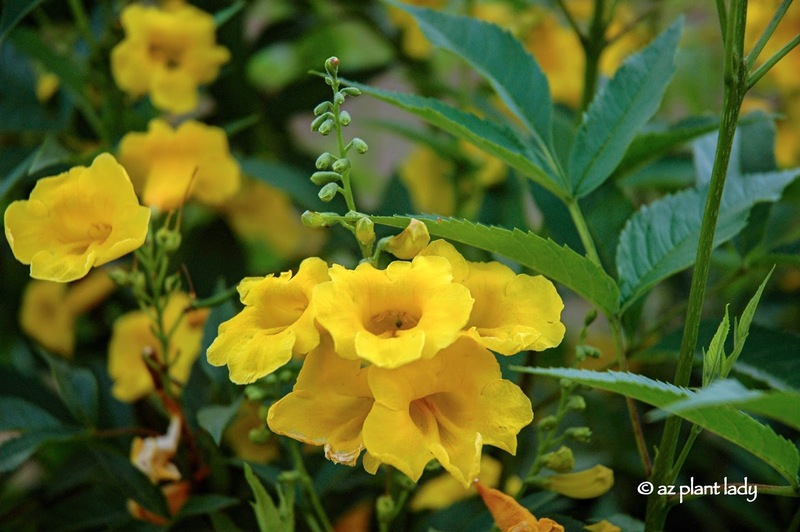 Yellow Bells is a large shrub that grows to a height of 4 – 8 ft. and spreads 3 – 8 ft. wide. You can find its native habitat in the Americas. There are two different types; Tecoma stans angustata and Tecoma stans stans. Visually, the most significant difference is in the shape of the leaves. Tecoma stans stans had a broader leaf and are pictured above and below. Because of its size, this large shrub makes a great backdrop plant. I have used it to screen fences, sheds and also planted it up against the house. Yellow Bells works well as a tall, naturally-shaped hedge. This shrub thrives in full sun to filtered shade. They do best in warm-winter areas but can be successful as a summer annual in colder regions. This shrub is relatively low-maintenance. It will freeze back in the winter months when temperatures go below 28 degrees F. Since it blooms on current season’s growth, all that is required is to prune back the frost damage in early spring. Seed pods are produced and can be removed if desired, which will extend the bloom period and improve the appearance, (the seed pods do not bother me, and I do not remove mine). After an initial application of slow-release fertilizer when planting Yellow Bells, I have not needed to fertilize further. **Occasionally, caterpillars will appear but can be easily removed by spraying some BT (Bacillus thuringiensis) which is an organic pesticide. There are many familiar names for these beautiful shrubs. Tecoma stans angustata is native to the Southwestern US and northern Mexico and goes by the names Arizona yellow bells, yellow bells, and yellow trumpet bush. 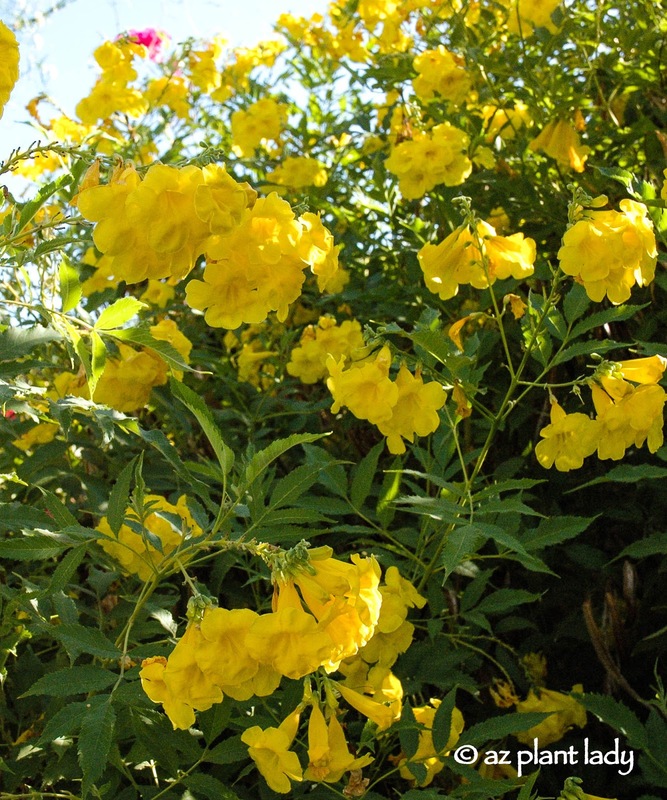 Tecoma stans stans are native to Florida, the Caribbean and parts of South America and also goes by the name of yellow bells and sometimes yellow elder. Because of the overlap of familiar names, be sure to purchase plants based on their scientific name. View of my back garden, which includes ‘Rio Bravo’ Sage in the forefront, Palo Verde tree, Arizona Yellow Bells and Bougainvillea. – I am not a neat gardener; my garden has a messy, carefree look to it. – I like low-maintenance plants that don’t need a lot of attention from me, as long as they look beautiful. – I would rather be inside during a summer day, enjoying the comforts of my air-conditioner, instead of outside in the garden in the heat. – I don’t always prune my plants at the right time of year. I am more of a “Do as I say, not as I do” person. – I am a horticulturist who sometimes wears nail polish. – I am a Certified Arborist who does not climb trees; I tell people how to prune them instead. – I don’t have a lot of cacti in my garden. – I have a floppy hat that I wear when gardening that my daughters wouldn’t be caught dead wearing. -I hate cleaning up after myself when I finish pruning, so I bribe my kids to do it instead. My eighteen-year-old daughter and the newest addition to our family – my 11-year-old daughter. My two youngest children, they are six months apart in age. They are very busy with their own lives but are always available to bring their pick-up truck when I need it. Okay, so she might actually not assist me, but she does keep me company in the garden. My birthday gift from my husband. Tobey is from our local animal shelter, and he loves dirt. He came with the name; he makes me feel safe. Now if only I could keep him away from my shrubs…they don’t need to be watered by him. So, that is all about me and my life as it relates to my life as a horticulturist. My passion for plants makes me happy, and I love nothing more than to help people learn how to grow beautiful plants that thrive in our desert climate.